The JBL VRX932LA-1-BAG Padded Protective Carry Bag (Black) is designed to carry and protect a JBL VRX932LA-1 12" 2-way Bi-Ampable Line Array system P.A. speaker. The bag is made from 1200 denier nylon with a waterproof backing, 10mm interior padding and soft Tricot fabric interior lining. It has a large external storage pocket with 1.0" gusset. The bag includes a provision for fastening 2 VRX932LA-1-BAG to a VRX Sub transporter to create a mobile system. It is carried by exterior lifting handles with overlapping touch fastener wrap. 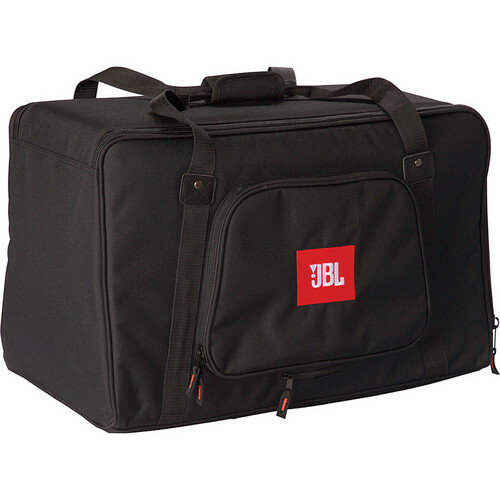 The bag has an embroidered orange JBL logo on the front. Includes provision for fastening 2 VRX932LA-1-BAG to a VRX Sub transporter to create a mobile system. Box Dimensions (LxWxH) 30.0 x 15.0 x 3.5"